Virtualization is the biggest trend in IT today. 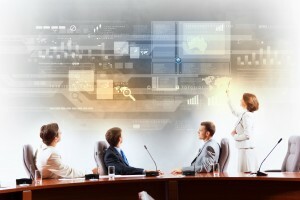 Virtualization will account for 98 percent of spend on IT growth by 2020. This increased spend in virtualization will provide more efficient, cost-effective ways to reduce downtime, gain IT productivity, increase hardware savings, and so much more. 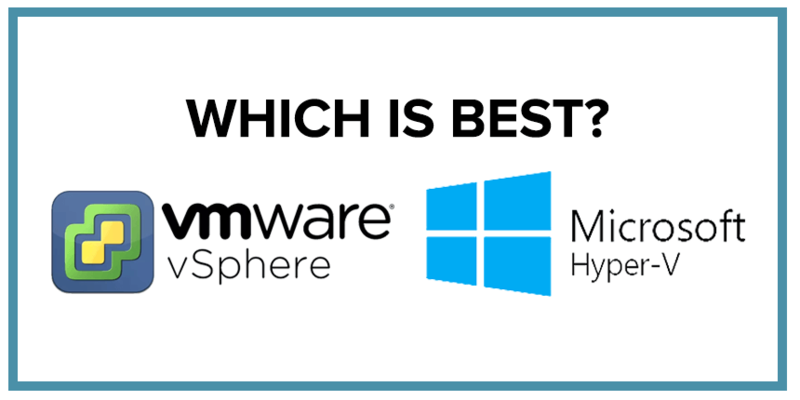 In an effort to decide what makes virtualization so successful, we set out to compare two of the most popular solutions: VMWare and Microsoft Hyper-V. While both virtual platforms are comparable, they both represent a different set of advantages and disadvantages. Let’s dig into these comparisons to help you decide what solution is right for your business. Before we jump into each virtual platform individually, let’s touch on the various options available for virtual machines. 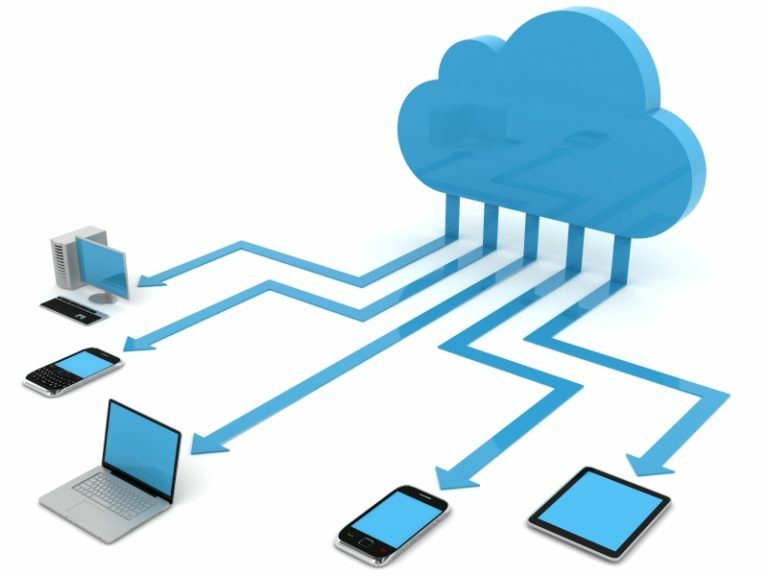 Desktop virtualization services provide the flexibility of having a virtual desktop where you can deploy a wide array of applications. Server virtualization services allow you to create virtual servers, thus being able to enjoy energy and cost savings at the same time. Both VMWare and Hyper-V are hypervisors that enable you to deploy virtual servers and desktops. 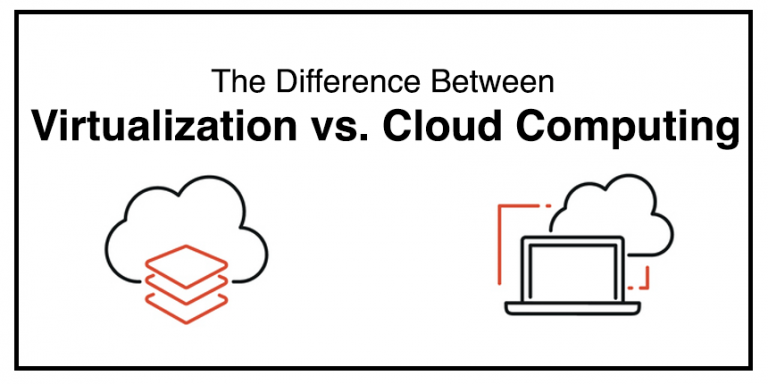 Both are highly configurable and can help organizations of all levels obtain virtualized systems inside of a hybrid cloud or a data center. While this article won’t delve into all of the types of virtualization architecture, it will focus on the what VMWare and Microsoft Hyper-V use to implement server virtualization, which is called Type 1 VMM architecture. The Controlling Layer (top layer): Controls the components that run within it and provides components for virtual machines to communicate with the Hypervisor Layer. 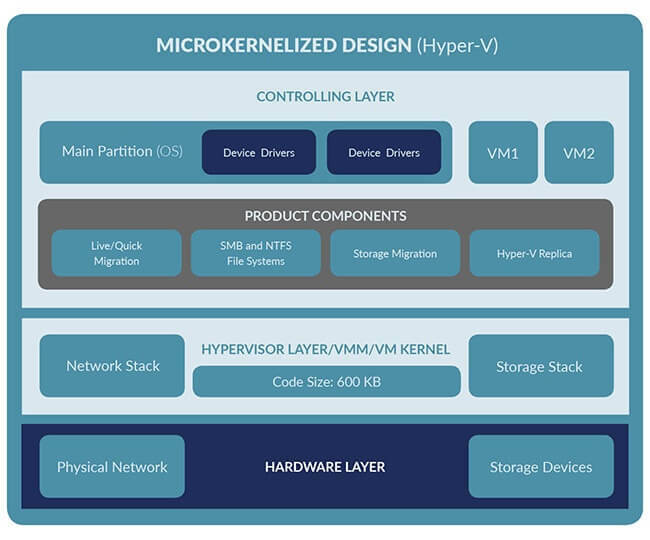 The Hypervisor Layer (middle layer): Virtualizes the Hardware Layer and runs directly on top of it. The Harware Layer (lowest layer): Houses the Physical Network and Storage Devices. With this basic understanding of the two types of hypervisor design architecture, let’s examine how each differs as well as the advantages and disadvantages for both. VMWare offers an array of solutions for virtual systems, namely vSphere. Companies who are looking to take a virtual or hybrid leap will find that VMWare products are capable of getting the job done. There are also various versions to choose from, including the Standard Edition, Advanced Edition and Enterprise Edition. Network Stack: This implements the VMWare networking. Storage Stack: This allows the Controlling Layer components to access the storage devices. VMWare’s new offerings are based in the cloud, which is hosted by Amazon Web Services. This news was launched at VMworld 2017, which has many people excited about the possibilities. With VMWare being on AWS, it means people will have access to an array of SaaS services. The advantages include an intuitive approach because it doesn’t require an operating system to control all of the components for virtualization and there are no security patches required for the components in the Controlling Layer. VMWare also provides readily available high-quality support. There is access to many governance capabilities, plus companies can benefit from the transparent page sharing, therefore many enterprises find it to be a perfect fit. There are some disadvantages for VMWare, too. For instance, you can’t run VMWare vSphere on hardware that isn’t supported. However, VMWare does provide a list of compatible hardware. In addition, more initialization time is required and because device drivers are initialized in the Hypervisor layer, if any corrupted code is put in the Hypervisor Layer can cause the initialization to slow down, or even cause the server to get hung up in certain cases. The learning curve is high for some, which is off-putting for those who are looking for a user-friendly solution. The free version of the product also doesn’t provide full functionality, so it’s important to understand what you’ll be getting if you test the free version. Hyper-V by Microsoft is capable of helping organizations to virtualize their workloads, scale services in a public cloud, as well as to build a private cloud. It is built directly into Windows Server, though it can also be installed as Hyper-V Server, which is standalone. Instead of being part of the Product Components, the Hypervisor Layer houses the Network Stack and Storage Stack. 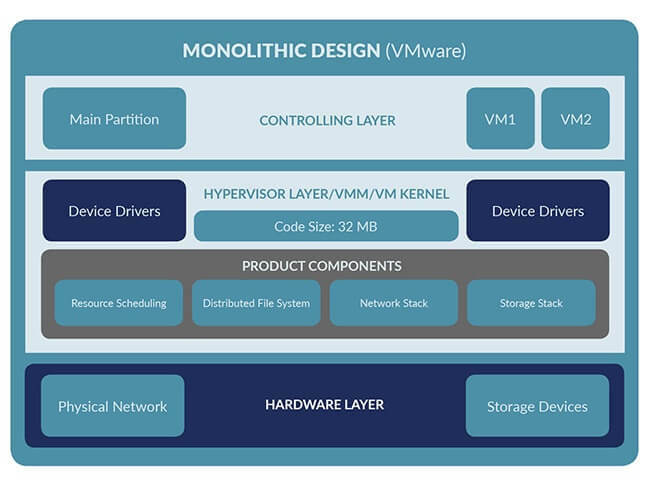 Like the Monolithic Design of VMWare, the Hardware Layer houses the Physical Network and Storage Devices. As far as advantages, Hyper-V has a smaller learning curve for administrators who already have a background in Microsoft products. But the big advantage of using its Microkernalized Design lies in the decrease in managing device drivers as they are not needed for new devices to be incorporated, meaning they are not hypervisor-aware, so a wide range of devices can be used. The device drivers are also directly installed into the Operating System (OS) that runs in the Controlling Layer, and the devices are then used by the virtual machines to access the hardware (in the Hardware Layer). Additionally, installing and deploying new server roles outside of the server virtualization role is possible to do within a few minutes. And initialization time is reduced since the Microsoft Hypervisor code is only 600 KB, so the Hypervisor role doesn’t require more time to initialize its components. Unlike the Monolithic Design of VMWare, there is no risk of corrupted code being injected into the Hypervisor Layer because Microsoft doesn’t provide APIs to access the layer, thus minimizing the attack surface. In terms of maintenance on the virtual systems, it does not result in any downtime and it’s easy to complete backups and live migrations. Windows Active Directory also provides a comprehensive level of security. There are some disadvantages to Hyper-V that are worth noting. The biggest disadvantage is the fact that the OS has to be installed in the Controlling Layer before the Hypervisor Layer can operate. And if the OS crashes, all other virtual machines will in turn crash. Windows OS and security updates will be needed for the life of the product, requiring more management, and there is more overhead for the OS in order to manage the communications between the virtual machines and the Hypervisor Layer. And finally, there are a limited number of guest OS choices supported, as well as little to no support for service templates and RemoteFX. It’s important that you look the benefits of virtualization before choosing between Hyper-V and VMWare. Both solutions are popular and have a broad user base of companies that depend on their services. Much of the decisions will be based on your virtualization administrator and their ability to roll out one or another without a significant learning curve. And furthermore, which of the hypervisor designs will work best for the organization. It’s best to determine what it is that you need out of a virtual system and then look at both VMWare and Hyper-V as a potential solution to allow you to have a hybrid or virtual setup within your organization.